Endurance E300 Elliptical Cross Trainer is one of the best home fitness equipment in the market today. 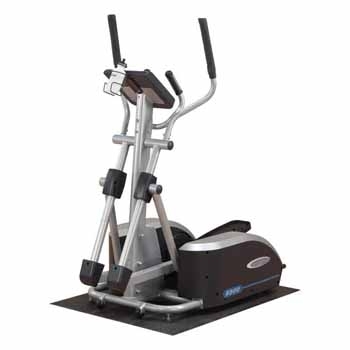 This elliptical cross trainer also has capacity to take upto 300 pounds. Also it has unbeatable Lifetime In-Home Warranty on frame, 5-years on parts, 1-year labor.It features an oversize pedals which fits almost everyone. It comes with Patented Center Drive design which results into a steady, space-saver platform, reducing rocky or shaky movements during workout. ToughTrain 3.0 out of 5 A good machine but you can find even much better features within the same price range. EllipticalReviews.net 2.5 out of 5 It could be just right for average-height adults seeking a reliable, space-saving exercise machine. Look for some other machine within the same range. *Note: Most of the sites, stores or shopping portals listed above sell Endurance E300 Elliptical Cross Trainer with discounts and other exciting offers. There is a possibility that the some of above websites are not selling Endurance E300 Elliptical Cross Trainer now. Toughtrain.com is not liable for such cases or instances. Also we do not recommend any seller for Endurance E300 Elliptical Cross Trainer and a buyer should buy from where he/she gets best deal with quality of products, service and on time delivery (shipment).